Being a nanny and a babysitter is an extremely important job. You are responsible for caring for and keeping safe a parent’s most precious gift. The days are filled with changing diapers, washing and refilling sippy cups and/or bottles, playing, reading, changing more diapers, and playing some more! It’s a tireless job that sometimes goes unnoticed. Not by this mom! Read the thank you Laura Harris wrote to her sitters for everything they do. ” My two kids are at the babysitter’s today. They’re running around in the watchful and loving care of my friend, Seyly, while I sit in a cafe and type on my laptop, listening to movie soundtracks in my earbuds. This is my one full day outside of the home to work as a freelance writer. My one day to chase my dream. The rest of the week, I chase my other two little dreams. One has my laugh; the other has his daddy’s. For a long time, I felt guilty about doing something like this for myself. Then, I realized, it really does take a village. You, the babysitters, helped me overcome some pretty difficult stuff, and it’s time I shared my thanks with you. Soon, I’ll pull into my friend’s driveway, and feel a flutter of excitement at the thought of seeing my children. I’ll open the door and find them both, safe and sound, racing around the house. It’s possible that they’ll react to my entrance by running away and sobbing, but I’ve come to take that as a good sign. They had a good time. What a sweet thank you! Read the full blog here. 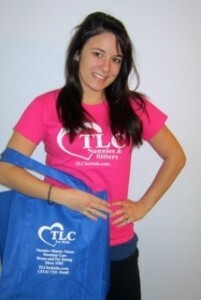 If you are interested in becoming a nanny or babysitter contact TLC for Kids! We are hiring in St. Louis, Atlanta, Miami, Boston, Tampa, Orlando, and Jacksonville. Great Part Time Jobs Available Today! Are you reliable and do you love working with kids? TLC for Kids has flexible part time jobs with competitive pay and great hours! TLC for Kids offers many types of nanny positions (full time, part-time, and after-school), but we also offer temporary babysitting positions. These temporary jobs are great for students! As a TLC temporary nanny, you have complete control over your own schedule—there is an online calendar where you post your available hours. The calendar lets the agency know when you are available, so when a family calls and requests a sitter for Monday from 9am-5pm, they know they can call you for the job. This type of scheduling allows you to go to school, maintain your social life, volunteer, etc. Another perk of being a TLC sitter is the pay: a minimum of $12/hour (most of the families also tip their sitters). You always get paid for four hours of work, even if you only work for three. For example, if a family only needs a caregiver from 3pm-6pm, they are required to pay their sitter for four hours worth of work. You can also earn more money by taking multiple jobs a day. If you work for one family from 7:30-4:30, it is easy to get another job that goes from 5:30-10:30. The more you work for TLC for Kids, the more families start to request you and the more your income grows.